Yes it’s true, the country called Greenland is covered in ice and snow, whereas Iceland has rolling fields of green. But why did things end up this way? So Greenland got it’s name from a guy called Eric The Red, who was quite a shady character it seems. Originally born in Norway, Eric The Red and his family were forced to leave when his father committed manslaughter and was banished from the country. They all settled in Iceland but things didn’t go well there either for Eric. This time it was he and not his father who had the problem though, he got tangled up in some big disputes and ended up battling…then killing…several men. Afterwards he was put on trial and banished from Iceland for 3 years. So he got on a boat and spent the 3 years of banishment sailing around and exploring a pretty much unknown area that was near Iceland. When his 3 years were up he went back to Iceland and immediately started talking up the new land he had been exploring. Apparently a master of PR (or is that BS?) Eric The Red made sure to um, let’s just say exaggerate the positive qualities of this new land and not mention the downsides. He named this new land Greenland, knowing that many folks living in a place called Iceland would be inspired by the paradise vision such a name would inspire. His plan worked and he was able to recruit many people to follow him to the new land and establish a settlement. 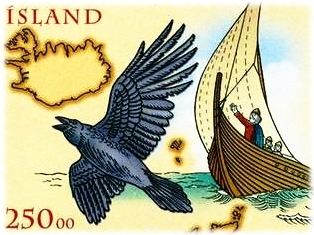 Now as far as Iceland goes, there is a story that says Iceland was given such a forbidding name as a way to discourage too many people coming around, especially Vikings who would be looking for places to plunder. But apparently this is just a myth. Turns out Iceland was named by a guy called Floki Vilgeroarson, who seems to be on the opposite scale of Eric The Red as far as honesty is concerned. 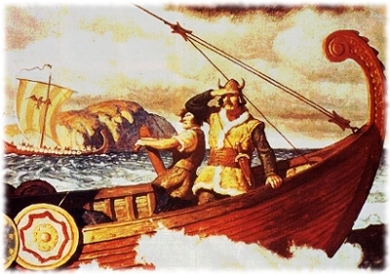 Like Eric The Red, Floki also originally lived in Norway. There he had heard rumors about a far off and interesting land, and so he decided to take some of his family and friends on a journey there to see what it was like. It ended up being a journey of loss for him. Sadly, one of his daughters drowned near the Shetland Islands. And another decided that she didn’t want to go to the land in the west and ended up getting married at a stopover in the Faroe Islands. Despite all this Floki still wanted to find his way to the rumored land. He faced a huge problem though, as he was setting off from the Faroe Islands he no longer was sure which way he should go. The story goes that had brought three ravens with him and decided to release them in hopes that they would show him the right way to go. The first one flew back to the Faroe Islands. The second one…well it flew straight back into the boat and refused to go anywhere. Oops. But luckily he had brought three ravens because the third one did something useful and flew in a northwest direction and never came back. 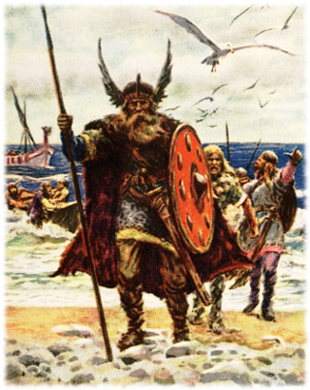 Floki felt that this was a good omen and that there must be land that way, and he was right. He found a land in the midst of summer, beautiful and quite warm. So imagine his surprise when after staying there for a while a bitterly cold and soul crushing winter hit. He and his little group of family and friends experienced much hardship that winter, and on top of everything all his cattle died. This was not the most fun journey he’d ever made to say the least. While waiting for the spring to come Floki hiked up the highest mountain near where his group was camping, and there he saw a large fjord full of drift ice. It was there that he decided to name this new land ‘Iceland’. After spring came Floki hightailed it back to Norway. Because of all the negative experiences he’d had in Iceland he told everyone back home that it was not a good place to settle. He didn’t want anyone to waste their time going to a place that was that bad. Problem was, he had only seen a small slice of Iceland and not the greatest parts that’s for sure. Later settlers were able to find and experience the best of what Iceland has to offer. So there you have it. Greenland, a place 3/4 of which is covered in ice, was named by a guy who wanted to trick people into thinking it was full of warmth an greenery. And Iceland was named by a guy who mistakenly thought it was full of ice an wanted to make sure nobody was fooled into thinking otherwise. Pretty interesting how that worked out, don’t you think? 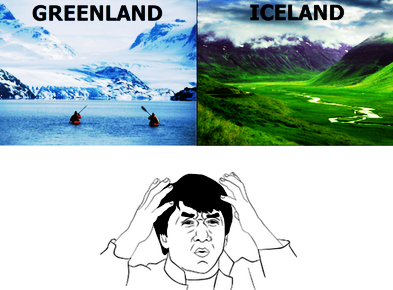 I always being in a confused state on why Greenland and Iceland were named. After going through the article mentioned in this page, i am pleased the content and information provided. Thank you. Funny thing is, that it is everyone except us Greenlanders who call it “Greenland” Our country is “Kalaallit nunaat”. Can you show how that is pronounced, like the dictionary does. I’m sure if I spoke Greenlandic it would be no problem, but I just speak English. Your country – Kalaallit Nunaat is one of the most fascinating country I have ever visited. Have a look at the photobook that I published on it recently. 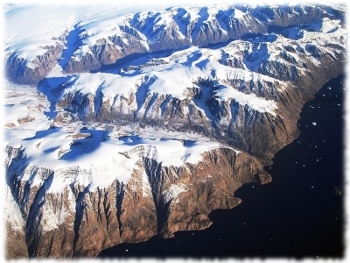 is Greenland really filled with ice? does it have four seasons? when is the best time to visit? any information and photos you could provide would be appreciated. thank you! 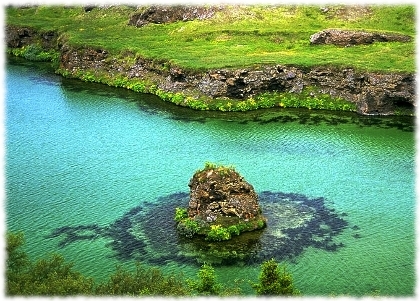 Very interesting story.I was confused as to why it was called Iceland,now after reading the story I could only smile. Nice one.